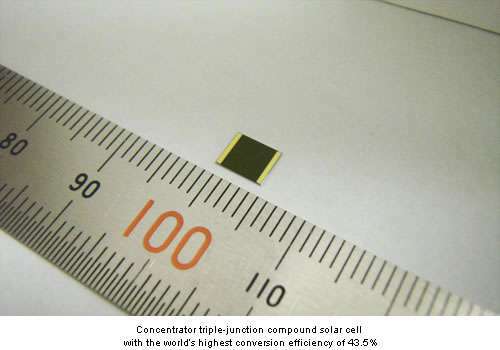 Sharp Corporation has achieved the worlds highest solar cell conversion efficiency of 43.5% using a concentrator triple-junction compound solar cell. These solar cells are used in a lens-based concentrator system that focuses sunlight on the cells to generate electricity. Compound solar cells utilize photo-absorption layers made from compounds consisting of two or more elements, such as indium and gallium. The basic structure of this latest triple-junction compound solar cell uses Sharps proprietary technology that enables efficient stacking of the three photo-absorption layers, with InGaAs (indium gallium arsenide) as the bottom layer. To achieve this latest increase in conversion efficiency, Sharp capitalized on the ability of this cell to efficiently convert sunlight collected via three photo-absorption layers into electricity. Sharp also optimized the spacing between electrodes on the surface of the concentrator cell and minimized the cells electrical resistance. This latest Sharp breakthrough came about through research and development efforts that are part of the R&D on Innovative Solar Cells project promoted by Japans New Energy and Industrial Technology Development Organization (NEDO). Measurement of the value of 43.5%, which sets a record for the worlds highest concentrating conversion efficiency, was confirmed at the Fraunhofer Institute for Solar Energy Systems (ISE) in Germany. Because of their high conversion efficiency, compound solar cells have been used primarily on space satellites. Sharps aim for the future is to apply this latest development success into concentrator photovoltaic power systems that can efficiently generate electricity using small-surface-area solar cells and make them practical for terrestrial use. Amazing efficiency. The main drawback is probably cost. There's no cost-per-kwh information, and the use of indium and gallium might be uneconomical for large-scale production. However, from the design looks it like cheaper materials could be substituted at the InGaP level. For air-conditioning applications, efficiencies greater than about 25% have the compound benefit of cooling the micro-environment around the home and thus reducing air conditioning requirements.